Here are samples of our "Create-a-Cover" choices. When placing your order (or just getting a quote for a custom printed book cover), if you select our "Create-a-Cover" option, you'll have your choice of any one of these cover designs. If the cover sample you select has a photo, you should provide us with YOUR photo to put on your cover. For example: design #9 has an S-shaped cut-away with a photo of a diamond ring and pages of a book. While your cover would still have the S-shaped cut-away, you would supply the photo that goes inside of it. 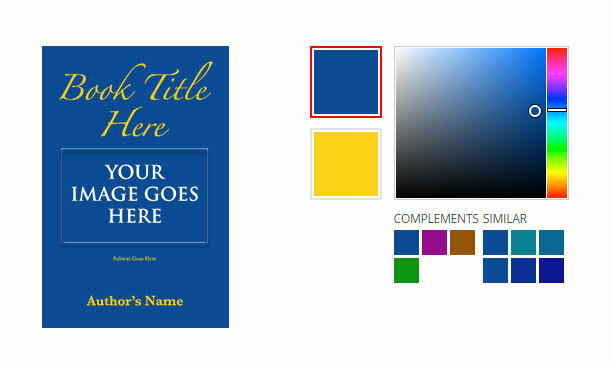 To create a book cover, simply click the design that you like, and go to Step 2 to choose your colors. A thumbnail of the design that you chose in Step 1 will appear on the left, with a 'color picker' on the right. Choose two colors from our color picker. Slide the rainbow slider up or down to get to the approximate color, then choose a color from within the large gradient. Do the same for your 2nd color. We'll use our judgment in designing your cover with that color combination. But don't stress about your color choices when creating a book cover. After you see your PDF Proof, you can make one set of changes for free before completing the create-a-book-cover process. After your order is placed, you'll be able to upload the wording you'd like, and any photos or clipart that you want included on your custom printed book cover. We'll put it all together for you, and send you a PDF proof to look at. Minor corrections to the proof are free, and you'll get a great-looking, inexpensive book cover. Need more than a basic cover design? If you have more complex requirements, Our 'Custom' Cover Design is a little more elaborate. One of our Graphic Designers will give you a call to discuss your book cover. We'll get your input, then create a couple of rough drafts of covers. Simply let us know what you like or dislike about each of the rough drafts. We'll make whatever changes you need, and create a book cover design that you'll be happy with. We also offer options like inside cover printing.